Manufacturing wire and cable, rods, tapes, tubes and fasteners requires lubrication. Before further processing, such as galvanizing, extrusion or welding, the lubricant residues need to be cleaned off. 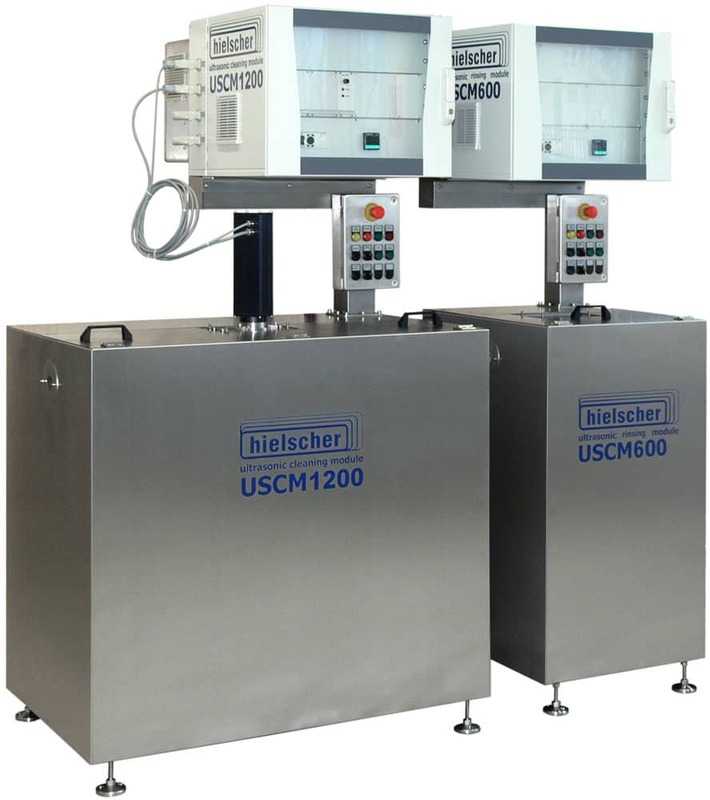 Hielscher Ultrasonics offers you a unique ultrasonic cleaning process for efficient inline cleaning. 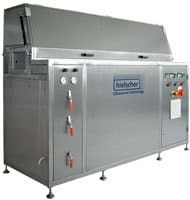 Ultrasonic cleaning is an environmentally friendly alternative for the cleaning of continuous materials, such as wire and cable, tape or tubes. The effect of the cavitation generated by the ultrasonic power removes lubrication residues like oil or grease, soaps, stearates or dust. In addition, the pollution particles are dispersed into the cleaning liquid. By that, a new adhesion to the material to be cleaned is avoided and the particles are flushed away. By the use of an innovative proprietary ultrasonic technology, very strong cavitation fields are generated, so that very good cleaning results at high line speeds can be accomplished. As the cleaning effect is based on the physical cleaning effects of the ultrasound, it can be used for any ferrous and non-ferrous material, e.g. stainless steel, copper, aluminum, but also plastic or glass. 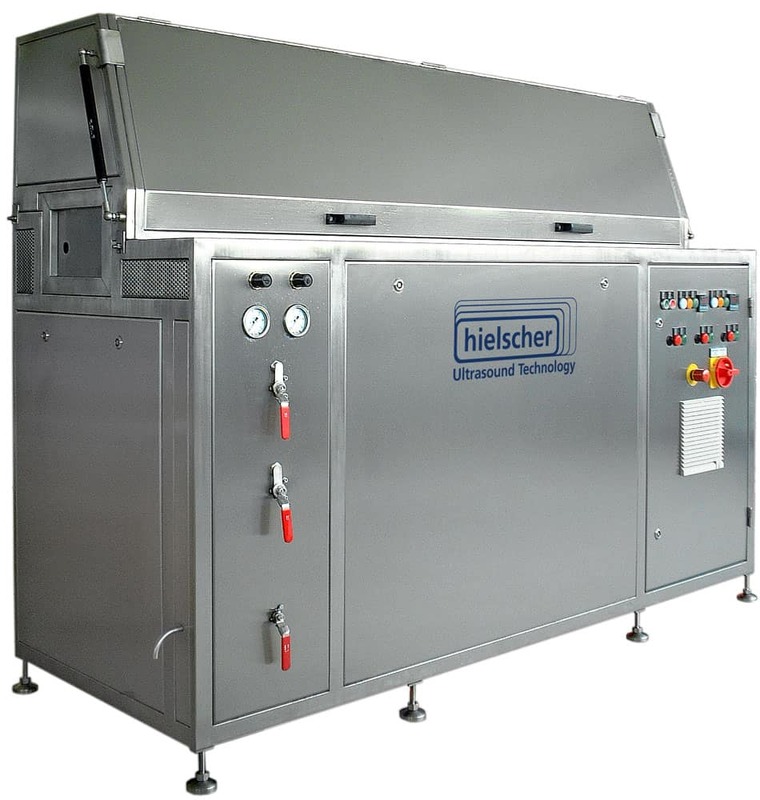 Most commonly ultrasonic cleaning machines are used for drawn wire, e.g. before cladding or extrusion. By the concentration of the ultrasonic power to a low liquid volume, a very compact design can be realized. This can be easily integrated into existing or new production lines, e.g. directly after drawing or reel payoff. Cavitation is an effect, that is generated in liquids by intensive ultrasonic waves. The resulting pressure waves create vacuum bubbles, that implode subsequently. As a result of these implosions, very high pressures and temperatures occur in combination with liquid jets of up to 1000km/h. At surfaces, these mechanical forces loosen impurities, so they can be flushed away with the cleaning liquid. For an intensive cavitation – and by that for an intensive cleaning – high amplitudes and a low ultrasonic frequency (approx. 20kHz) are needed. 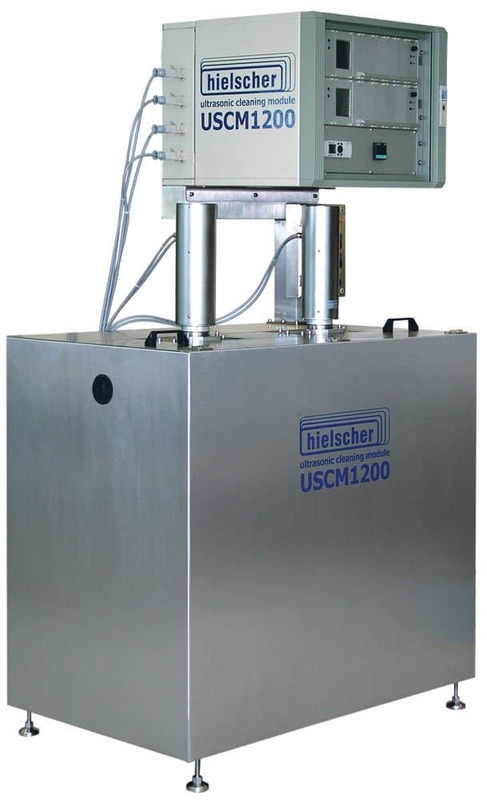 The picture to the right shows the strong cavitation in liquid generated by the ultrasonic modules of Hielscher Ultrasonics. The compact design contains everything that is needed to clean a wire or tape. In addition, the cleaning tanks, pumps, heaters, filters and oil-skimmers, air-wipes for the final drying are installed in the system, too. The whole cleaning system is made of stainless steel, so that there are no problems with corrosion. A sound protection cover reduces the sound emissions to a level below usual international limits for the production area. The manual operation is reduced to a minimum of uncomplicated moves and switches, in order to take off work from the operator. 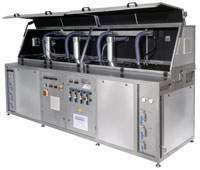 The liquid regeneration inside the system allows for a prolonged use of the cleaning liquids. This in combination with the efficient transformation of electrical power into mechanical cleaning enhances the environmentally friendly balance of the complete system. Customized design serves for an optimal adaptation of the system to the requirements of the particular cleaning process. In a range from individual modules for low cleaning speeds to high speed cleaning systems various designs are possible. Besides the appropriate ultrasonic power and a PLC for an automatic operation control, features, such as the geometry of the complete system can be adapted to restricted space conditions or particular line heights. In addition, special drying devices are optionally available, in case drying with compressed air is insufficient for the particular wire. The ultrasonic processors were designed for industrial heavy duty use. They have a high efficiency in the conversion of electrical energy to mechanical oscillations. They were constructed to operate continuously; and they are splash water proof – just in case. Their individual power of up to 4000 Watts allows for very high oscillation amplitudes, that are needed for an effective cleaning. 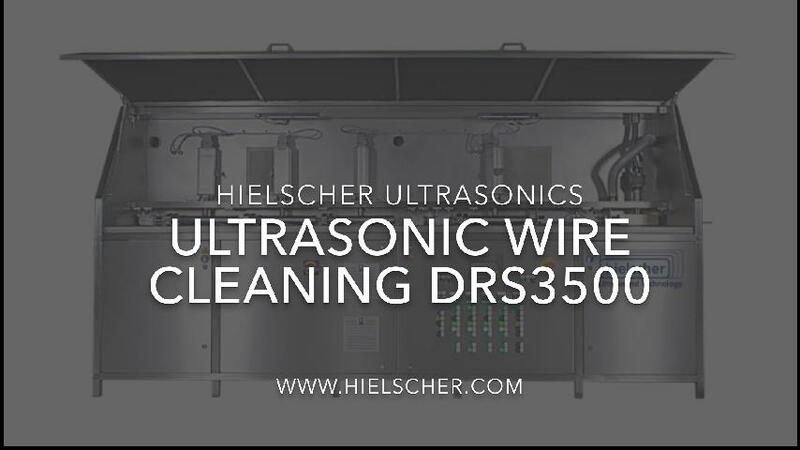 The number of ultrasonic devices needed, depends on the number and diameter of the wires to be cleaned, as well as on their pollution, and on the desired line speed. 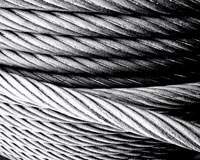 We will be pleased to assist you in this matter, on the basis of our extensive experience in the wire cleaning. The sonotrodes were invented and designed for the special task of cleaning continuous profiles, such as wires or tapes. 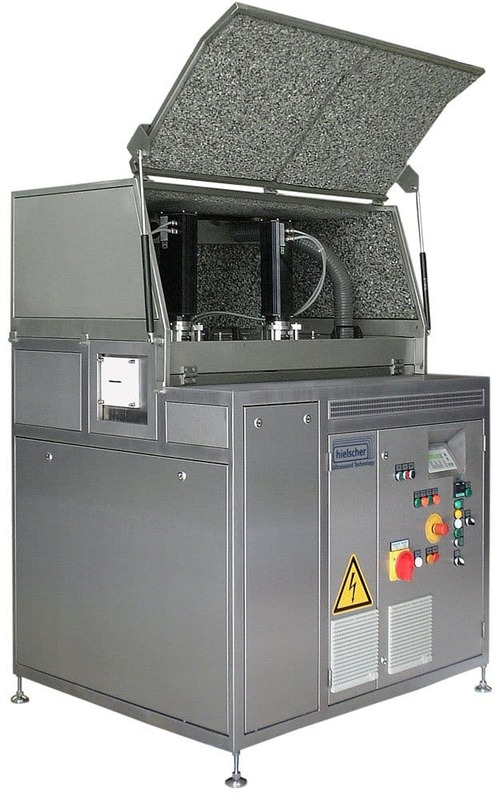 The ultrasonic power is concentrated in the liquid surrounding the wire in the cleaning bore. This results in extremely high power densities of up to 100 Watts per cubic centimeter. 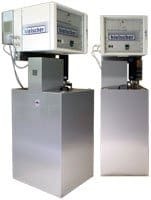 Common ultrasonic baths achieve not more than 0.02 Watts per cubic centimeter. In general, the diameter of the bore should be 3 to 4mm wider than the cross-section of the material to be cleaned. Our standard sonotrodes are capable of cleaning 32mm wires. Larger material as well as special shapes can be cleaned by custom specific designs. 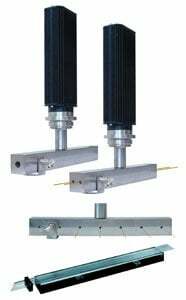 Special sonotrode geometries allow for a simultaneous cleaning of several wires in one single system. Therefore the appropriate sonotrodes are integrated into standard systems. The cleaning principle – and so the cleaning power is identical to that of systems for the single line cleaning. The choice of the right sonotrode is determined by the number of wires and their individual diameter. Furthermore, flat sonotrodes can be used for the cleaning of wide tapes or many parallel wires. For this, sonotrodes are installed above and beneath the material. By this principle, it is possible to clean wire cloth or wire mesh, too. 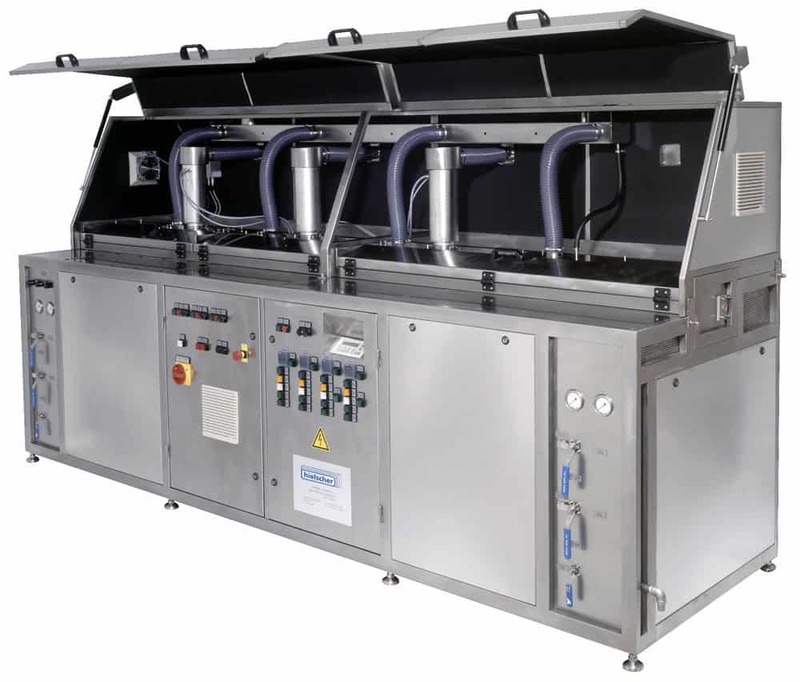 In our DRS systems, complete liquid circuits within the system supply the cleaning and rinsing modules with liquid. The cleaning and the rinsing circuit are separated from each other. Each circuit has filter cartridges, that remove dust particles from the liquid. In addition, the cleaning circuit can be equipped with an oil skimmer. For an effective cleaning the circuits are equipped with heating elements. These two circuits and processing aggregates are integrated in a system frame. 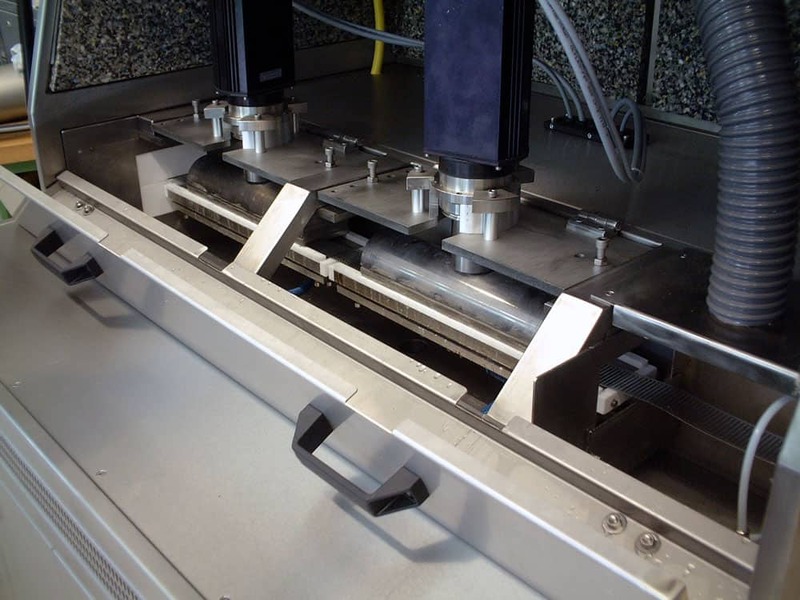 The footprint of the standard systems measures only 1500mm or 2000mm in length and 750mm in width. With their compact design, the systems can easily be integrated in already existing product lines. The picture below shows the schematic of a wire cleaning system with two tanks. 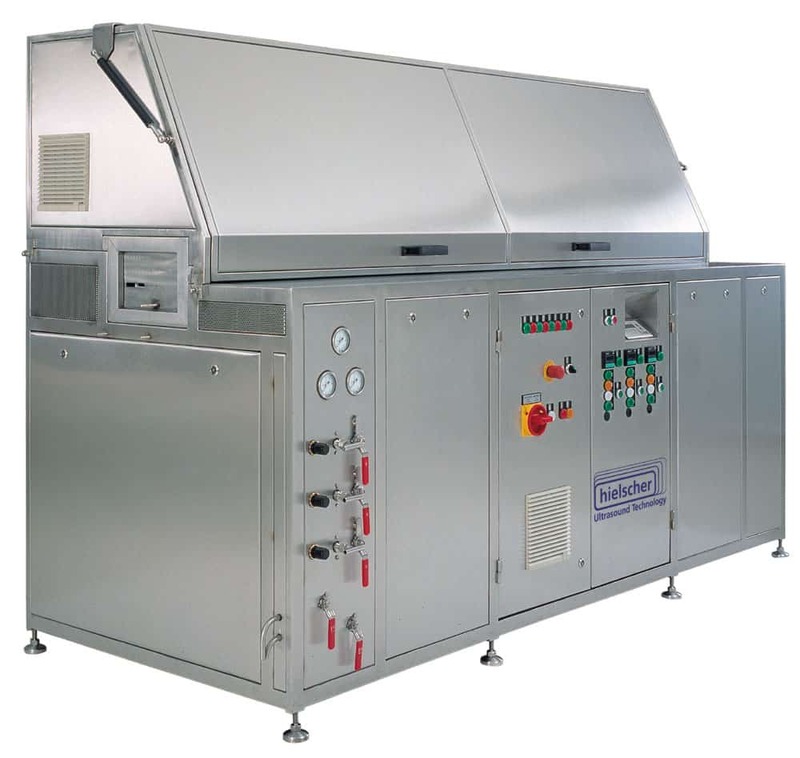 Systems for 24/7 operation are equipped with two cleaning tanks and two rinsing tanks. This configuration permits the maintenance of single tanks during the system is in operation, so that the tanks can be drained, filled and heated up to operating temperature individually. The PLC grants a smooth operating sequence with an automatic switching between the tanks and a fill up. In addition, it controls all relevant functions of the system and passes on corresponding status signals to the central production control or as text information to the display. Signal inputs and outputs can be adjusted to the requirements of the customer. 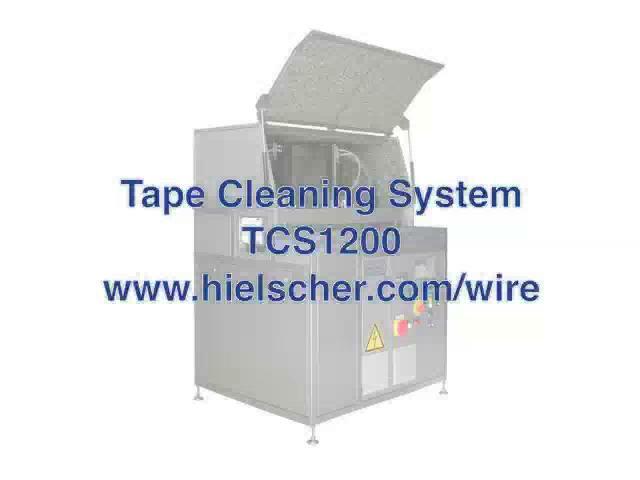 Optional components such as belt filter units, brushes or special drying modules complete the wire cleaning system. The wide range of optional components guarantees that the capacity of the wire cleaning system corresponds entirely with the demands of the customer. 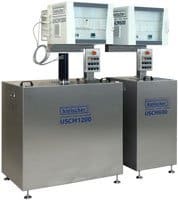 More Information about the Ultrasonic Cleaning! Please use the form below, if you wish to request additional information regarding this application. We will be glad to offer you an ultrasonic system meeting your requirements.